After some tourists found Koh Phangan, they celebrated with a couple of friends and drank the beauty of the island under the full moon and the idea for a monthly returning full moon party was born. The early beginnings, travelers celebrated Bob Marley, Bee Gees, Eric Clapton and the Scorpions who lead the music scene. 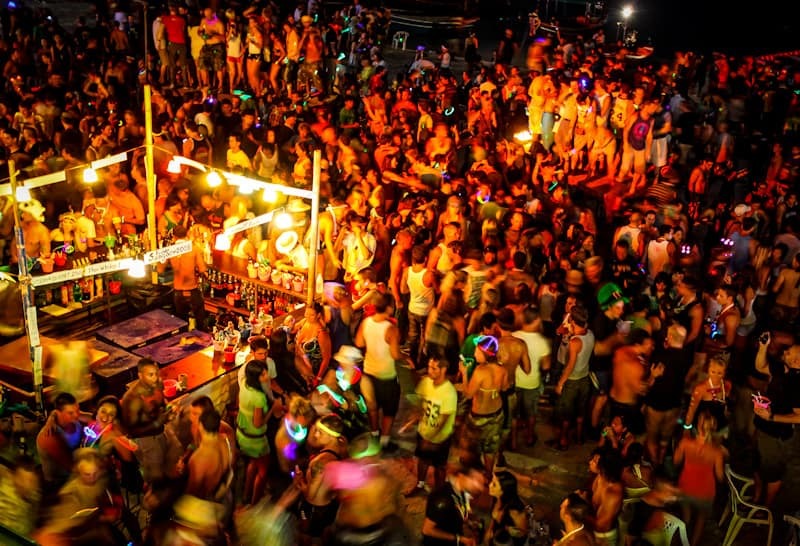 With years passing by, the full moon party has developed to be a monthly commercial event for travelers to Koh Phangan. The type of music played has changed from the softness to a massive headbanging crowd under the moon who enjoy the beats and various DJ’s of electronic dance music (EDM). Different areas have been set at various locations to party the night at Backyard Club, Cactus Drop in, Outback, Paradise bungalows, Reggae House, Same-Same, Sunrise Beach Club, The Rock, Tommy Club and Zoom bar. Full Moon Party is definitely one to visit, but be careful at all times.